After surviving the sense of loss that came when I finally finished reading Masters of Rome, after failing to be engrossed by The Friday Night Knitting Club, what could I do but turn back to another of my Old Favourites — those tried-and-true books that have pulled me through the best and worst times of my life, that have made me laugh, cry, and changed the way I see the world. 1. I have this thing (as you know) about preferring novels by women and being suspicious of novels by men, yet two of Wilton Barnhardt’s three novels would make my Top Ten list of Favourite Novels Ever. Should I say of him, as I do of Nick Hornby, that he writes as well as a woman? I don’t know. 2. Nothing makes you realize how much literature is a matter of subjective personal taste like reading Amazon customer reviews of a book you love. Some people adore this book as much as I do; others thing it’s complete garbage. Funny that. Makes me feel better about people not liking something I’ve written. 3. When we eventually go all Star-Trekky and switch entirely to digital rather than paper books (and I myself am seriously being lured by the Sony Digital Reader and the Amazon Kindle right now, with happy thoughts of the trees I will save), the thing I will miss most is the beat-up look of an old, much-loved, much-read book. I pick up my copy of Emma and I am viscerally reminded of all the places this book and I have been together, going back to Oshawa in the late 80s when Cathy and I both read it and thought it was hilarious. 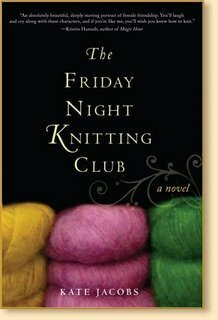 The Friday Night Knitting Club is one of those books that fits very comfortably in the “women’s fiction” niche — commercial rather than literary, but much better-crafted than most genre fiction. Heartwarming, tear-jerking, and just a teensy bit formulaic, this novel was an enjoyable read but not one I’ll be stirred to read again. It’s the story of Georgia Walker, a single mom in New York City who owns a knitting shop. Georgia has a twelve-year-old daughter, a mentor-like older friend who helps out in the shop, a former best friend who treated her badly years ago and has now reappeared, and an ex-lover who also treated her badly and has also reappeared wanting a place in her life. Frankly, that would be enough of a cast for a novel of this scope, but Jacobs also throws in the women of the titular knitting club that meets at Georgia’s store, and this is where I think she goes a little overboard, cramming too many storylines into a novel that can’t quite bear the weight. I ran across an online review while I was reading this that, without giving away too many details, said the ending was “depressing,” so I was braced for something bad to happen at the end, and something bad does happen. Don’t go into this expecting a typically happy ending. This is a series of books so epic, the word “epic” doesn’t really do it justice. The seven gigantic books (average length seems to be about 700 pages) sweep through over a hundred years of Roman history, from Julius Caesar’s forerunners Marius and Sulla, up to Caesar Augustus. I started this series years ago, when The First Man in Rome (1990) originally came out in paperback, and I just could not get into it. I didn’t know a whole lot about ancient Roman history then, and it was off-putting in the same way Russian novels are off-putting — so many characters, each with three long names, yet only a handful of first names to distribute among the lot of them, so you get your Gaius Cornelius Rufus and your Gaius Lucius Ahenobarbus and so on and so on. I gave up. Flash forward to the present day, when McCullough’s magnum opus has finally finished with the publication of Antony and Cleopatra in 2007 (she originally intended the previous book, The October Horse, to be the last in the series, but apparently succumbed to fan pressure to write one more book about the great tragedy that Shakespeare couldn’t resist, closing the saga with Antony’s and Cleopatra’s deaths and Octavian/Augustus’s rise to undisputed power). Meanwhile, I haven’t been idle either — I’ve been watching HBO’s Rome, as I may have mentioned a million or so times, and getting fascinated with Roman history. So I decided a great summer reading project would be to plough through McCullough’s series. Every avid reader has a concept of what includes good “summer reading” or a good “beach book.” Some people like their beach books to be light, fun, frothy reads that don’t demand too much intellectually. I can see the value in that, but my main requirement for summer reading is that books have to be engaging enough to retain my attention, but not SO engaging that I’m going to race through them avidly in a day or so. A long, well-researched, but sometimes dull historical saga is ideal because I can dip into it for twenty minutes by the pool while the kids are swimming and know that it’ll still be there in the beach bag when I go back to it. I won’t have been driven by the urge to stay up all night finishing it, thus leaving me without a beach book the next day. So this series perfectly fit my definition of summer reading. OK, this one wasn’t inspirational fiction, but I picked it up at the library while I was waiting for one of the McCullough books to come in on hold. It’s part of the same series as Masque of the Black Tulip, which I read a couple of years ago — a series of novels that are one part historical spy novel, one part historical romance, and one part anachronisitc (but fun) chicklit. 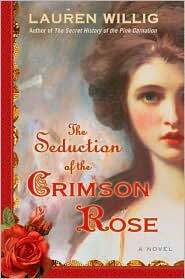 They all deal with English spies in the era of the French Revolution. This book, like the other one I read (and I’m sure like the other two if I were to read them) is fun, frothy, and just a bit forgettable — I know the characters from Masque of the Black Tulip appeared as minor characters in this novel but I honestly couldn’t remember a thing about them or their storyline. This one was actually a little more memorable since the romance plot featured a heroine who’s actually not a very nice person, and a hero who’s sort of like a sinister Lord Peter Wimsey. I thought that was very well-done. You have to give Lauren Willig props: she’s managed to create a totally readable and fun series of books out of a well-researched historical footnote, and she’s earned a law degree and launched herself on a legal career while doing it — which is impressive. Her “flower spy” books will probably never rank among my all-time favourite historical fiction, but they’re good for a quick, entertaining read. Patty Froese Ntihemuka’s second Biblical novel brings to life the two sisters from Bethany, Mary who sat at Jesus’ feet and Martha who stayed busy — and resentful — in the kitchen. In fleshing out the few scriptural references to these women and their brother Lazarus, the author has also drawn on the tradition that identifies Mary of Bethany with the woman taken in adultery, portraying Mary, as many writers have done, as a prostitute whose life is changed by an encounter with Jesus. Ntihemuka also weaves in a storyline inspired by Ellen White’s Desire of Ages, in which Simon the Pharisee (at whose feast Mary anoints Jesus’ feet) becomes a powerful but hypocritical kinsman whose sexual abuse of Mary when she is still a child leads her into a life of sin and shame. The few breaks I’ve taken this summer from reading my way through Colleen McCullough’s immense Masters of Rome series (to be reviewed at summer’s end!) have mostly been to pick up a few lighter novels published by Christian presses for some Sabbath reading. I write for a Christian publisher myself, and I have a Christian romance that I’m hoping to find a publisher for, so I sometimes write this sort of thing off as market research. And, sadly, much of it confirms my belief that a lot of what’s published as “Christian fiction” is not only not literary — I don’t really expect that — but that it doesn’t even meet the standards of good commercial fiction. Far too many of the novels that come from Christian presses (or Christian imprints of mainstream presses) are second-rate genre fiction, formulaic, with clumsy writing, poorly developed characters and flimsy plots. OK, now that I”ve got THAT off my chest — I really liked Lisa Samson’s Club Sandwich. This is on a par with bestselling commercial women’s fiction — there’s a richness and depth to the story and characters, and a level of style and skill to the writing, that’s all too often absent from the products of Christian presses. I would be happy to pick up another Lisa Samson book and read more of her work.